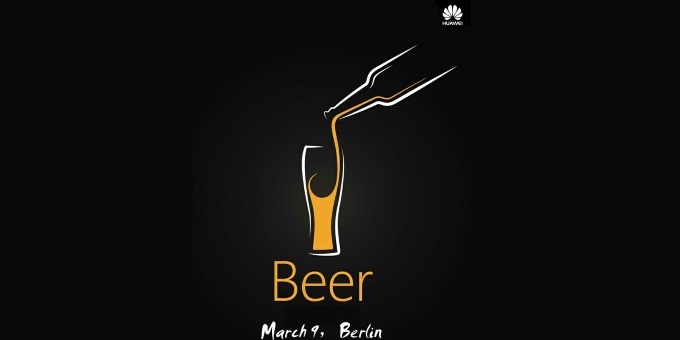 Chinese smartphone manufacturer Huawei is holding an event in Berlin next week. The company has posted a teaser image for the event which is scheduled for March 9 in the German capital. Aside from the date and city, the teaser doesn't reveal anything else about the event. However, it does show beer being poured in a glass, although we're not sure what it has to do with the event, especially the word 'Beer' below the glass. If at all it's a smartphone-related event, then the Huawei P9 will most likely be the star given that the device has been the subject of several leaks and rumors in the past few weeks, and not to mention that there have already been rumors that it would be unveiled in March 2016. Its rumored specifications include Kirin 950 CPU, 5.2-inch 1080p display, 3GB RAM, and 3,900mAh battery. The handset is also said to come in as many as four variants. In Chinese, the pronunciation of Beer is "P Jiu". Jiu is the pronunciation of number 9. So Beer=P9. Huawei will unveil the phone for sure.